Srinivasa Ramanujan was an Indian mathematician who, with almost no formal training in pure mathematics, made substantial contributions to mathematical analysis, number theory, infinite series and continued fractions. 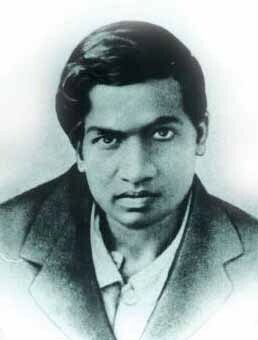 Born and raised in Erode, Tamil Nadu, India, Ramanujan first encountered formal mathematics at age 10. He demonstrated a natural ability, and was given books on advanced trigonometry by S. L. Loney. He had mastered them by age 13, and even discovered theorems of his own. He demonstrated unusual mathematical skills at school, winning accolades and awards. By 17, Ramanujan conducted his own mathematical research on Bernoulli numbers and the Euler- Mascheroni constant. He received a scholarship to study at Government College in Kumbakonam, but lost it when he failed his non-mathematical course work. He joined another college to pursue independent mathematical research, working as a clerk in the Accountant-General’s office at the Madras Port Trust Office to support himself. In 1912-1913, he sent samples of his theorems to three academics at the University of Cambridge. Only G. H. Hardy recognized the brilliance of his work, subsequently inviting Ramanujan to study under him at Cambride. During his short lifetime, Ramanujan independently compiled nearly 3900 results (mostly identities and equations). Although a small number of these results were actually false and some were already known, most of his claims have now been proven correct. He stated results that were both original and highly unconventional, such as the Ramanujan prime and the Ramanujan theta function, and these have inspired a vast amount of further research. However, some of his major discoveries have been rather slow to enter the mathematical mainstream. Recently, Ramanujan’s Formulae have found applications in crystallography and string theory. The Ramanujan Journal, and international publication, was launched to publish work in all areas of mathematics influenced by his work. This hostel has 20 Nos. of flats to accommodate PG/Ph.D students and other University Guests.